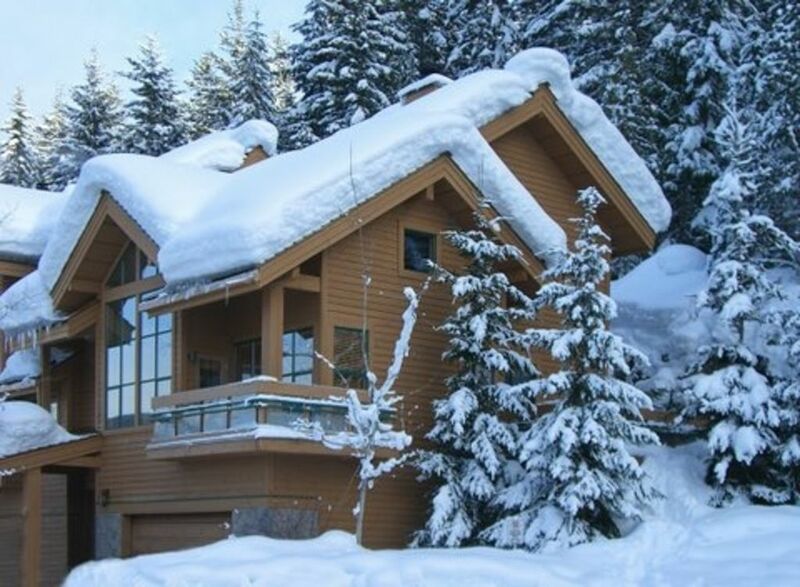 Book our luxury home for your next vacation with views of the Valley Mountains and only a short distance to the heart of Whistler village, Gondola and with access to the ski trails just a short walk away from the house. Located in the popular Northern Lights Luxury Complex on Whistler Mountain, perched above the Westin Resort & Spa this five bedroom, four bathroom, three level town-home offers mountain views, a private hot tub and wood burning fireplace among other great features (see photos and video for tour of the home) to make your vacation memorable. Relax in the cozy open plan living and dining room with vaulted cathedral windows whilst enjoying the view of the valley mountains, wood burning fireplace and the fully equipped kitchen which features stainless steel appliances and granite counters. Head out to the private balcony and enjoy views of the surrounding mountains while tending to the BBQ or relax in the private hot tub on the side deck. The garage and entryway are located on the first floor with stairs leading up to the main living floor. Located on the top floor is the master bedroom which features a four poster king bed, flat screen TV and an en-suite bathroom with a double vanity and large shower. The second master bedroom also on this upper level features a queen bed and en-suite bathroom with a double vanity, and a bathtub with overhead shower. The third and fourth guest bedrooms are located on the main living floor. The third guest bedroom features two bunk beds (one with a double bottom bed) and the fourth guest bedroom features a queen bed and sliding door access to the deck with the hot tub. The separate bathroom on this level features an over-sized glass-enclosed shower and double vanity. The fifth bedroom is on the entry level and features a queen/ twin bunk bed with an en-suite bathroom with an over-sized glass-enclosed shower and flat TV. Truly a home where your holiday memories will be made. Book your discounted lift tickets when you book this home and they will be waiting for you when you check in. Concierge and check in office for all of your needs whilst staying at our home are available to you. Ski-in via a ski trail off the Lower Olympic ski run that ends with a climb down 100 plus stairs to the middle of the Northern Lights neighborhood just a few homes away from your front door. Guests can use this same access, just a short walk from the house, to ski-out by climbing up the stairs and then a short hike up the ski trail to the Lower Olympic run. Alternatively drive or taxi 2 minutes to the base of Whistler Village to access the gondola and lifts adjacent to the Westin Resort & Spa. The ski access is more suitable for intermediate and higher skiers. This home features an in-suite washer and dryer, garage parking for two standard size vehicles and complimentary wireless internet. Whistler and Blackcomb mountains have been voted No1 ski hills in North America over the years, skiing at its best or some fun hiking or mountain biking in the summer months; a great place to visit. Will fit two standard size vehicles. Entrance is on the ground floor with a few steps. We have 5 bedrooms on three levels and the living area has a vaulted ceiling and an open plan living room with large windows with mountain views with a Southwest Facing so it is bright and cheery. 40' LCD flat screen TV with DVD. The dining area has a vaulted ceiling with huge windows. The dining room table seats up to 10 people. The kitchen is fully stocked including: STOVE/OVEN FRIDGE DISHWASHER TOASTER KETTLE MICROWAVE BLENDER COFFEE MAKER DISHES, POTS, PANS AND GLASSWARE. Gas BBQ, private Hot Tub, Wireless Internet. Unique Features: ski gear racks for snowboards and skis in 2 car Garage. The house is Private and Quiet with a 10 minute walk to main Village. Hike and Ski access to lifts. Northern Lights is a superior townhouse development, completed in 1995. Clean! Plenty of towels! Easy check-in. The ski in ski out was definitely tough but convenient. Would highly recommend! Wonderful location! Couldn’t have asked for better! Perfect accommodations! Very clean, nicely furnished and well-equipped! Will stay here again! Ideal location! Amazing property & a very accommodating owner! Thank you for welcoming us to your beautiful home. We had so much fun and made so much memories to cherish and share! Thank you so much for accommodating our needs and being readily available for help and questions. Thank you for making our stay in Whistler a trip to remember! Great accommodations for a large group! Very comfortable home for a large group who want extra space to relax, play games, and dine together. disturbing a sleeping person or their stuff. Wonderful property, exactly as described. The house was exactly as described. All the amenities were easily accessible. Concierge service check-in was fast and easy. Bedrooms are very spacious, on three floors. All the appliances and equipment are extremely well-maintained and well looked-after. The heating was on when we arrived, and the hot tub was hot and ready to use. Walk to Whistler Village or the ski lifts or ski in and out. Discounts are available for mid week stays and for certain extra days. A damage deposit of $1,500 is taken as a hold on your credit card when you check in. We only accept credit card payments either through this website.